I’m not sure how I feel about this news. 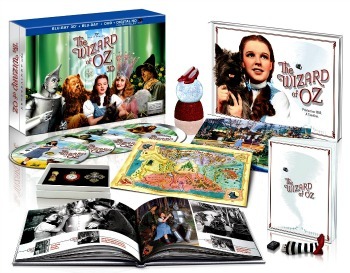 There’s a certain bit of nostalgia that goes along with watching “The Wizard of Oz” in its original format. Sure, I don’t mind the remastering and polishing, but IMAX 3D? It’ll be like seeing a whole new movie. Maybe that’s the point. Maybe we should celebrate this classic movie in a modern way. At any rate, we don’t have an IMAX 3D theater in Traverse City, so you guys will have to see it and report back on whether you like it. Yes, “The Wizard of Oz” hits IMAX 3D theaters on Sept. 20, 2013. It looks like a really cool set. If they send me a copy, I’ll use it as a giveaway. See that little striped leg and shoe in the lower right corner of the picture? That’s a flash drive! It’s been 74 years since the adaptation of L. Frank Baum’s timeless tale about a Kansas girl’s journey over the rainbow opened at Grauman’s Chinese Theater on August 15, 1939. Directed by Victor Fleming (who was in high demand that year; he also directed “Gone With the Wind”), “The Wizard of Oz” was produced by Mervyn LeRoy, and scored by Herbert Stothart, with music and lyrics by Harold Arlen and E.Y. Harburg. 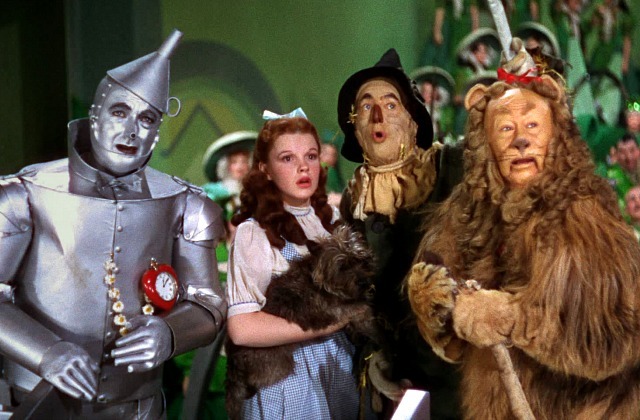 Dorothy was portrayed by 16-year-old Judy Garland, who quickly earned a reputation as “the world’s greatest entertainer.” Other players included Ray Bolger as the Scarecrow, Bert Lahr as the Cowardly Lion, and Jack Haley as the Tin Man (by the way, those character names are all copyrighted). Frank Morgan played six different roles, including the wonderful “Wizard of Oz” himself. “The Wizard of Oz” received five Oscar nominations, including Best Picture (Outstanding Production), and won two Oscars — for Best Song (“Over the Rainbow”) and Best Original Score. Garland received a special award for Outstanding Juvenile Performance. 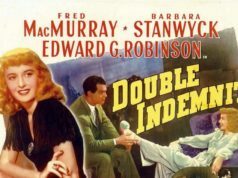 The classic film was an overwhelmingly popular and critical success upon its initial release and repeated its ability to captivate audiences when MGM reissued the film in 1949 and 1955. The film also made history with its network television premiere in 1956 on CBS. 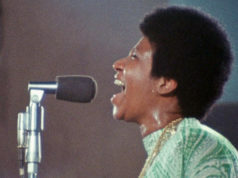 Nearly 45 million people tuned in for this first telecast, marking the beginning of an annual tradition. Ever since, “The Wizard of Oz” has been shown annually on network (and then cable) television. The IMAX release “The Wizard of Oz” will be digitally re-mastered into the image and sound quality of an IMAX 3D Experience with proprietary IMAX DMR (Digital Re-mastering) technology. The crystal-clear images, coupled with IMAX’s customized theatre geometry and powerful digital audio, create a unique environment that will make audiences feel as if they are in the movie. The film hits IMAX 3D theaters on Sept. 20, 2013. It’s rated PG for some scary moments. Runtime is 102 minutes. Visit “The Wizard of Oz” official website. Will you see “The Wizard of Oz” in IMAX 3D? If you do, report back. I mean, it could be really truly awesome.